Harbor front sailboat luxury home in a class of it’s own! 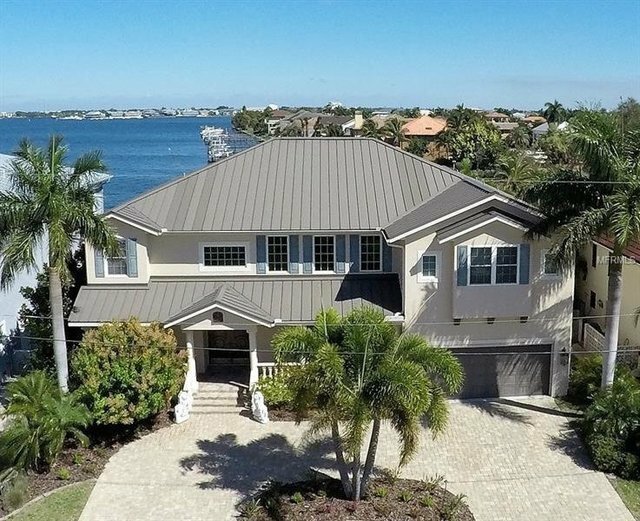 80’ of premium water frontage directly on Charlotte Harbor leading to the Gulf of Mexico! Stunning custom 5 bedroom, 4 bath, 2 half bath with elevator pool home on open water. This high-end home offers many finer finishes including exotic Brazilian Cherry wood floors, Labradorite stone counter in the formal dining room, 8' doors, coffered ceilings, crown molding, mahogany staircase and elevator with renowned artesian painting inside. The first-floor features 2 master suites with private ensuites, formal living room with wall-to-wall slider out to breathtaking water views, chef’s kitchen with huge cooking island, solid wood custom cabinetry, elegant lighting and inviting casual dining area. Guests can enjoy total privacy on the second floor offering 3 bedrooms, 2 baths, second laundry, artist studio and butler kitchen where they can sip their morning coffee and watch the dolphins swim on the open water from one of two balcony's. Entertain outdoors under the covered lanai to be enjoyed rain or shine or in the screened heated pool with convenient outdoor bath access and amazing views. Concrete seawall, dock and lift are featured with water and electric dockside. Unbeatable view of Charlotte Harbor, Peace River and Fishermen’s Village. Just a couple of minutes from historic downtown Punta Gorda featuring restaurants, shopping, community events and more; yet it is also convenient to I-75 and SWFL gulf beaches.